I’ve played golf in 50mph winds. I’ve played golf in 20 degree weather. I’ve played golf in bad thunderstorms (I know, that one was a mistake). I’ve done it all, and I’ve seen it all. After the first time you play in pouring down rain, you realize how important golf equipment and clothing/accessories can be. Golf clubs are not the only thing that you need to do research on before you know exactly what you should get. You would never just buy the cheapest golf clubs that you can, would you? So why would you buy the cheapest golf rain gloves for cold weather? Golf rain gloves range from terrible quality to pure gold. Some rain gloves don’t help you grip the club at all, while others get tackier the wetter they get. Unfortunately, those cost a lot more to produce, so they cost more to buy as well. It’ll make a huge difference in your game, though. If you play in inclement weather often, then you know that keeping your hands dry keeps your scores from getting out of control. I’ll never forget the first tournament that I played it when it rained all of the sudden. I didn’t have anything on me. No umbrella, no rain gear, no rain gloves. Nothing. It was miserable to say the least. My score was terrible, I had a terrible time, I was freezing cold and wet. I couldn’t hold on to the club at all. At the time, I was taking pretty large divots already. With the rain and no gloves, my club was getting stuck in the ground at impact. I had no chance at consistent contact, but I learned a valuable lesson. Tough times to look back on, that’s for sure. Now, I always keep rain gloves in my car. If there is a chance that it is going to rain, I transfer them to my bag. That way, I have them with me just in case I’ll need them. They are relatively inexpensive, considering the benefit that they provide. I don’t always recommend buying slightly expensive golf gear. Hell, this is actually one of the only times that I would encourage it. But you need to when it comes to rain gear. You’ll be wasting your money on cheap gloves, and you’ll eventually buy a good set later on. So go ahead and save yourself from the inconvenience and buy a good set now. Your hands deserve it. You might be wondering if golf rain gloves actually make a difference. If you buy a good pair, you better believe they do. The wetter that they get, the tackier they become. Don’t ask me how. I am not a scientist. But I know that my favorite pair of rain gloves is always going to allow me keep playing good golf, even in some rough rain. Let’s get into the best golf gloves for you. I am aware that nearly everyone is looking to save money, regardless of the little amount of money that they will save. 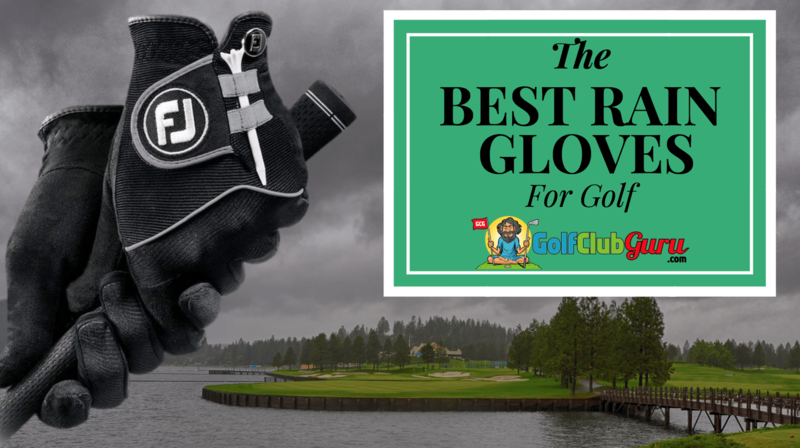 For that reason, I’ll list some of the best rain golf gloves on a budget, and the cheapest ones that I would recommend as well, for all you cheap folks. The best pair of rain gloves, hands down, is a pair of FootJoy RainGrip gloves. Every top pro and amateur golfer has a pair, and that is no coincidence. FootJoy does a lot of things well. They produce generally higher quality shoes, and they make great golf clothing. However, their hold (golf pun?) on the rain glove market is incredible. They are the cream of the cream rain gloves, without a doubt. The FootJoy RainGrip rain gloves get as tacky as you could imagine. In a small amount of rain, they get a little tacky. When it is pouring, they are super tacky. They will allow you to hold a club as you normally would, as if there was no rain at all. You won’t have to squeeze the grip super tightly like you would have to do with no rain gloves, or with a cheap pair. Another benefit of the RainGrip gloves is that they also work at keeping your hands warmer. If you play in cold weather, you can kill two birds with one stone with this pair. However, it needs to be noted that if you play in cold AND hard rain, no glove is going to be able to save you from that miserable combination. However, if you play in rainy OR cold weather, this is the set that you need to get. In every single article that I have written, I talk about the cheap stuff first. 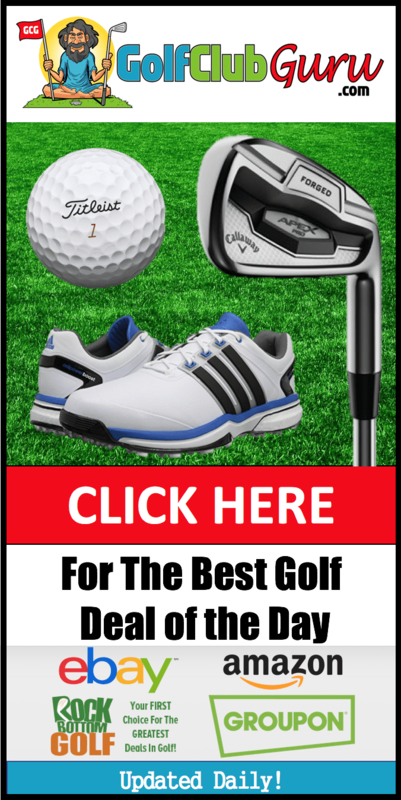 Most golf equipment will get the job done, so I try to save people money by listing the least expensive, but still decent quality items at the top on the articles. However, this is different. 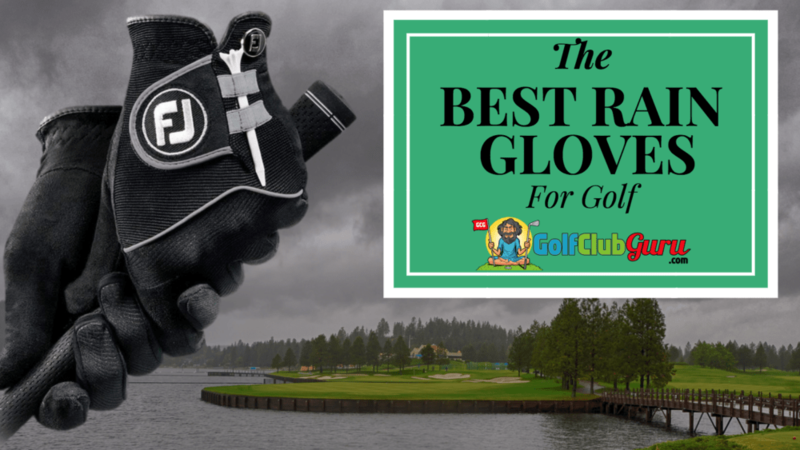 Here I talk about the best rain golf gloves first, as I think everyone should make the investment and get a pair. They will last you many years, and they don’t cost much more than the cheap gloves. If you a confused why there are two gloves, you’ll learn as soon as you try to play with just one. In hard rain, you’ll 100% need both gloves for your hands. I can’t stress how difficult golf is without rain gloves. These gloves have some magical powers as far as I am concerned. If needed, I keep them on as long as I need to, even for putting and chip shots. If it’s terrible weather, keeping them on is just more convenient, and ensures my hands are dry at all times. I’ll be upfront. I have not tried these gloves. I have tried the cheap gloves, and I have the FootJoy RainGrip gloves in my bag right now, but I have never tried a middle of the market set of golf gloves. After doing a good bit of research, though, it appears as if these Mizuno RainFit gloves are a great value set. Those that reviewed the gloves seemed pretty happy, considering what they spent. There were tons of 5 star reviews, most talking about how great of a deal the gloves were when it came to tackiness in the rain. However, there were some comments relating to them being good, but not “FootJoy” good. When you see reviews like that on a product’s page, you know that FootJoy has the best product on the market. Nonetheless, I’d 100% consider getting this pair next time I am looking to buy a pair of rain gloves. I’m always looking for lower priced alternatives of golf’s best, and this is definitely a competitor. Mizuno in general is a great brand. 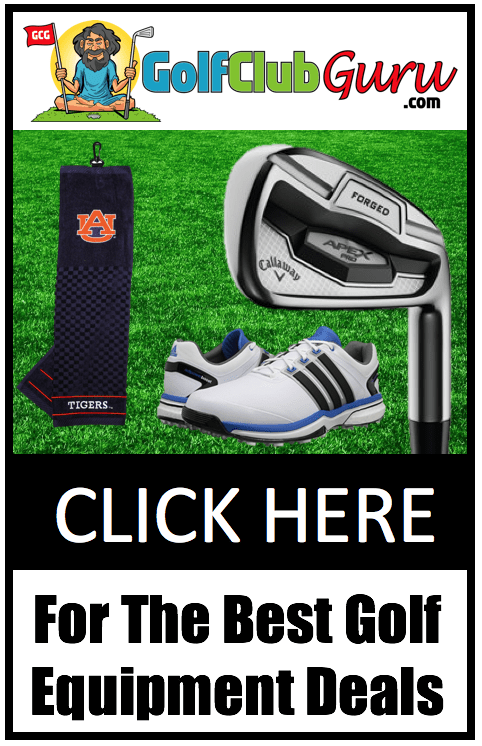 Most of their golf equipment is a little overpriced in my opinion, so I am surprised to see them with priced a couple dollars less than FootJoy’s rain gloves on average. Finger Ten is sorta at the bottom of the market for rain gloves, but I tried them a couple years back nonetheless. I saw a lot of good reviews from them, so I bought a pair just to try them out. For the price that I paid, I was pretty content. I just felt like I should have spent a little more money and bought a more premium set, though. The glove lasted a good while. I remember it taking a long time before I got to play a round in the rain with it. I definitely noticed a difference compared to a typical golf glove, but it was nothing like a higher end glove. There was some tackiness, but I felt like I still had to grip the club pretty hard to keep it from slinging out of my hands. If you are new to golf and don’t expect to play in the rain a ton anyway, then this is the glove for you. This is also the rain glove set for you if you don’t have much money to spend on golf gear, but you still want to have a decent glove to play in the rain with. Highly recommend you try Mokom Premium Golf Gloves (www.mokomgloves.com) each with 138 laser cut holes in multiple sizes that offer the most breathable glove in the market. Their glove performs terrific in all weather conditions – especially rain. In addition, the combination of premium cabretta leather and hi-tech grip material provide the optimal balance of improved grip for lower grip pressure and natural touch for better club feel. Have you ever thought about writing an ebook or guest authoring on other sites? I have a blog centered on the same information you discuss and would really like to have you share some stories/information. I know my visitors would enjoy your work. If you’re even remotely interested, feel free to shoot me an e-mail.